We were blessed to have three guests in our home last week visiting our area with their college a cappella group. It was our first time hosting strangers overnight, so we were very excited. Due to my excitement, or perhaps something else, I made two silly mistakes while preparing dinner for us and our guests: 1) I forgot to double the soup recipe that I made, so it was going to serve 4 large bowls or 6 small bowls at most, 2) I made cornbread and forgot to put in the 2 cups of cornmeal. I’m not sure how these things happened as I’m typically a pretty good cook and pretty level headed person. In fact, with the cornbread, I had a moment before baking it that I thought, “Something is wrong; it’s not typically this watery and the smell is wrong.” I looked over the recipe again to see what I was missing, but somehow my eyes didn’t focus on ‘cornmeal’ and I baked it anyway, assuming I’d done everything correctly. But two amazing things happened. First, the soup was multiplied. I watched as each of the guests served themselves a full bowl, worrying there would not be enough, then one for my husband and a half bowl for our son. I assumed I’d just be eating salad, but I reached the ladle and pulled it up to see that there was enough for me after all! Later in the meal, everyone took seconds–including me: that makes 10.5 bowls. And when we’d all eaten enough, we had so much left it wouldn’t fit in our storage containers and had to be stored in a pitcher instead! The next day I counted 3 full bowls of leftovers. God multiplied my soup from 4ish bowls to 13.5 bowls!!! This is more than triple! I’ve made this same soup many times for our family and sometimes my husband and I have eaten it all in one sitting. This was truly a miracle! Second, the Lord did a miracle with my cornbread. It didn’t taste like corn–not even remotely. But it was MUCH BETTER than normal! It also had a very bread-like consistency despite being made almost entirely of liquid. I had warned the guests of my mistake beforehand: that the bread may be terrible and they were free to raid the refrigerator afterward. But it was not necessary, Jesus blessed us greatly, despite my lack of faith. 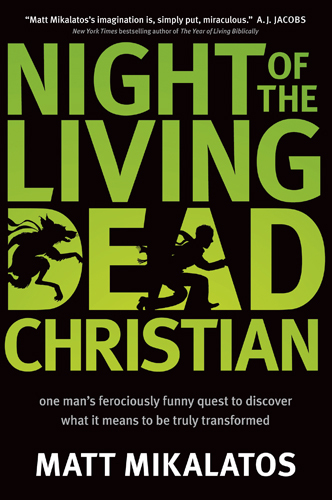 I’m not sure how to describe Night of the Living Dead Christian except that it’s full-on satire, very unique, and very good. Mikalatos mixes elements of fiction and non-fiction, and even includes himself as a character within the story. The story follows lycanthropic (werewolf) Luther Ann Martin as he discovers what it means to be a Christian and how to become free of his animalistic tendencies. Vampires, mad scientists, an android and a congregation of zombies are also woven into the narrative. Each of the monsters or monstrous conditions represent various problems or tendencies within human nature, and through this, Mikalatos demonstrates the process of salvation and reveals much about the state of the church. There is a congregation of zombies, for instance, that do not think for themselves and act just like their leader. They run around proselytizing, stuffing headphones of podcasts into their victim’s ears, and trying to eat their victim’s brains. I’ve met this sort of creature; perhaps you have too. Sometimes it takes imagining the world in fantastic terms to understand the reality; I love how Mikalatos mixes both realms outright. There is also an excellent Discussion Guide and Self-Diagnosis Guide to Common Monstrosities in the back of the book, which would be really fun to discuss in a small group or book club. Lately I’ve been reading and watching historical documentaries as much as possible because I really feel that understanding history is helpful to understanding where we are and what’s to come. This account of American history was especially insightful to me. Shirley weaves together newspaper reports, human interest stories, and other research to thoroughly portray the mindset, recreation, dress, social and spiritual beliefs, American leaders and celebrities, and day-to-day lifestyle of Americans in the month of the Pearl Harbor attack–really, there is no area he doesn’t touch on. And although the size of the book was a bit intimidating for me (535 pages plus an additional 100 or so of Notes and the Epilogue), Shirley writes in a way that is both accessible and captivating. I love how each chapter reflects one day from December 1941 (especially since it’s so dense with knowledge that readers may not want to read more than a couple days at a time). And by reading this, I really felt a grasp on this time in American history and the generations before me. This is a great addition to any library, especially for lovers of history. Invasion is a story of alien attacks, other universes, real-live comic book characters, super gadgets, and secret service agents, all mixed in with typical high school life. High school hero, Colt McAlister, discovers that his family has been involved in a secret military organization to defend the world against alien intrusions, and that the accident that killed his parents was no accident at all. Now it’s up to Colt and his high school friends to help the agency and save the world. Invasion is definitely geared toward teen readers, and even has a bit of teen romance (which I personally thought was well done), but certain adult readers may also enjoy it. In fact, I actually enjoyed reading it quite a bit. The characters were fun and personable, and the plot felt realistic despite being very imaginative. This is the first book in the C.H.A.O.S. Series*. I appreciated how it is a complete story in itself, though I can’t imagine readers not wanting to keep up with the series. *Edit: I had mistakenly thought Invasion was the second in the series (and read the book with that mindset), but it turns out that Lewis’ book I am Number Four is not related to the series. 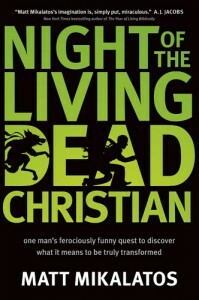 I received a complimentary copy of this ebook as a part of the Thomas Nelson Book Review Blogging Program through booksneeze.com.